Copyright is not, as is often thought, something that is periodically ‘extended’ to cover a new field or medium; rather, copyright redefines itself whenever its efficacy is challenged. While many factors have contributed to this process, the most consistent has been the challenges created by new technologies. The contributing authors build upon this insight to show that copyright law is, and has always been, a creature of technology. Each chapter focuses on a specific technology or group of technologies – photography, telegraphy, the phonogram, radio, film, the photocopier, the tape player, television, and computer programs – emphasizing the changes that each technology instigated and the challenges and opportunities it created. ‘fair copying’ (e.g., by libraries) is the necessary exception that proves the rule. 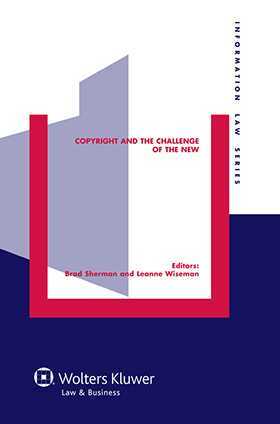 As well as providing insight into the ways that copyright law interacted with old technologies when they were new, the book also offers important insights into problems and issues currently confronting copyright law and policy such as the appropriate scope of copyright and the relation between copyright and the public interest. With the broad perspectives opened by these essays, academics, practitioners and policymakers in the field will find themselves well equipped to deal with the problems that will inevitably be created by technologies in the future. Chapter 1. Copyright, When Old Technologies Were New; B. Sherman, L. Wiseman. Chapter 2. The World Daguerreotyped – ‘What a Spectacle!’ Copyright Law, Photography and the Economic Mission of Empire; K. Bowrey. Chapter 3. The Electric Telegraph and the Struggle over Copyright in News in Australia, Great Britain and India; L. Bently. Chapter 4. The Phonogram: A Tale of Vested Interests and Seized Opportunities; J. Okpaluba. Chapter 5. Radio: Early Battles over the Public Performance Right; G. Austin. Chapter 6 . How Did Film Become Property? Copyright and the Early American Film Industry; O. Bracha. Chapter 7. The Story of the Tape Recorder and the History of Copyright Levies; B. Hugenholtz. Chapter 8. Making Copies: Photocopying and Copyright; L. Wiseman. Chapter 9. Public Ownership of Private Spectacles: Copyright and Television; B. Sherman. Chapter 10. A Square Peg in a Round Hole? Copyright Protection for Computer Programs; P. Samuelson.